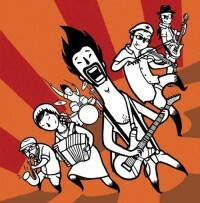 The Freak Fandango Orchestra is a multi-ethnic band from Barcelona. Their music is a explosive mixture of folk, polka, gypsy music from the Balkans and punk-rock. The band is composed by musicians with lots of different instruments (guitar, bass, drums, violin, saxophone, accordion and trumpet). They are influenced by artists like Emir Kusturica And The No Smoking Orchestra, Goran Bregovic and Gogol Bordello. They certainly have a mood-liftingly cheerful sound and an infectious sense of humour. Have a listen to Hitman’s Lovesong to see what I mean. The version embedded here features Paola Graziano.